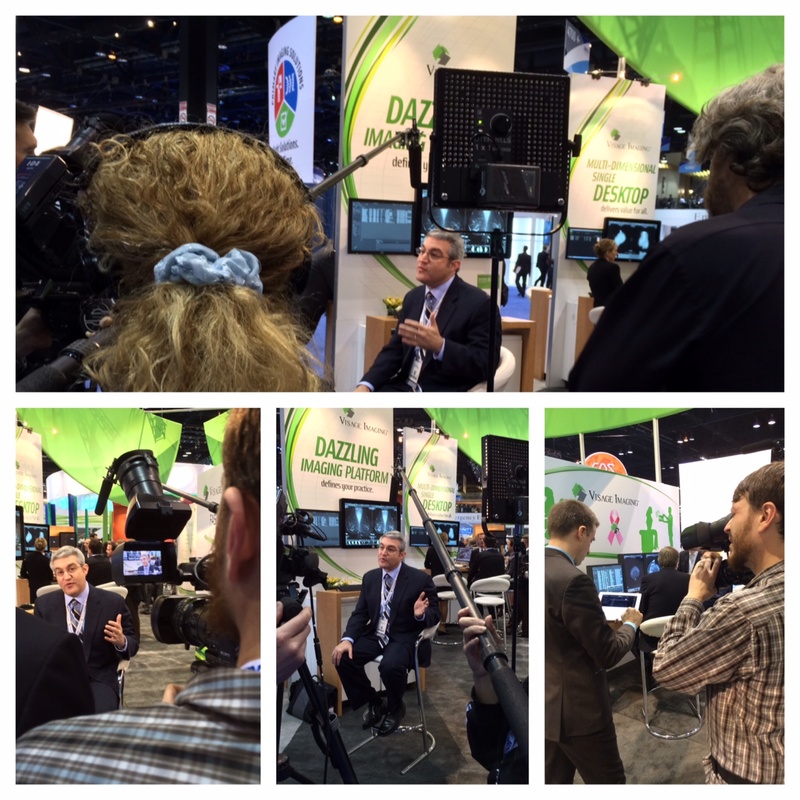 During one of the busiest times at RSNA 2013, Tuesday at Noon (to be exact), Visage Imaging and NVIDIA conducted an exciting video shoot in the Visage booth. Synergy between Visage 7 and NVIDIA® Quadro® technology was highlighted, (literally) putting the spotlight on the speed, scale, and impressive clinical capability of the Visage 7 Enterprise Imaging Platform. For customers who have not had the opportunity to attend RSNA or to see Visage 7 in action, the video provides an excellent lens into the energy of RSNA, as well as the clinical and technical dexterity of Visage 7. In the video, the multi-dimensional thin-client capabilities of Visage 7 are on center stage, demonstrating use on a variety of client platforms (PC and Mac), on single and multiple displays, using a variety of multi-modality presentations, non-DICOM visualization, and also showcasing mobile access via Visage Ease. When cutting-edge hardware and software work in tandem, the results are simply magical. Impressively at the 1:22 mark, be sure to take note of the visualization of digital breast tomosynthesis, better known as DBT or 3D mammography. Demonstrated at RSNA as a work-in-progress, the video highlights the 3D MIP for DBT, displayed side by side with CC and MLO views. These massive DBT studies dwarf even the largest imaging studies of the past, encompassing 1.5 gigabyte (GB) images per view, per breast, totaling 6 GB for each study. Due to patented Visage technology, server-side processing, and the powerful capabilities of NVIDIA Quadro, Visage 7 can display the massive DBT dataset for diagnostic interpretation over the LAN or WAN in approximately 2-3 seconds, down to high speed bandwidth connections (~6 Mbps). Because Visage 7 uses adaptive, intelligent streaming, the workarounds of legacy PACS are no longer required. For example, auto-routing or pre-fetching to the workstation never occurs, and no data is ever stored locally to disk. It’s all powered server-side, and streaming scalability is virtually unlimited using Visage 7 Render Servers powered by NVIDIA Quadro.